Here at Doctors Health Press, we have looked at a variety of obscure and outlandish foods and diets in the name of promoting better health. But this exotic healthy food may be the most bizarre yet, as further examination has been given to eating insects as a primary food source, a practice known as entomophagy. 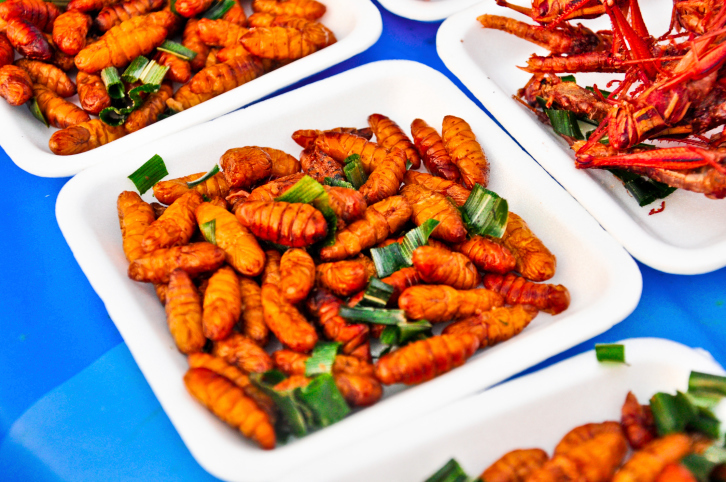 Two panel discussions held at the 2014 Institute of Food Technologists Annual Meeting & Food Expo on June 23 and 24 talked about entomophagy becoming more prominent worldwide as the global population grows and resources become more strained. Insects are a source of high-quality protein that is easy to digest, with some bugs being 80% protein by weight. In comparison to livestock, a major protein source that is raised on a startling 30% of the total land of the planet, cultivating insects would use not only less land, but also water, energy, and feed, while leaving a smaller environmental footprint. But the benefits of entomophagy don’t end there. Many insects, such as crickets, are low in fat and carbohydrates and high in calcium, calories, and vitamins. They also contain omega-3 fatty acids, as well as more essential amino acids than animals that serve as more “traditional” sources of protein in the United States. And while we may see entomophagy as gross, a large portion of the world disagrees, with most cultures, particularly in Asia and South America, and almost 3,000 ethnic groups eating bugs regularly. Of these edible crawlers, the most consumed are grasshoppers, crickets, locusts, silk moth pupae, and beetle and moth larvae. The disregard for entomophagy in North America and Europe is believed to have started when raising animals was introduced; supporting one food source meant disregarding another, not to mention the years of seeing insects as pests. Of the 1,900 species of edible insects in the world, 85 can be found in the U.S. So if you’re ready to expand your palette beyond escargot or kangaroo meat, there are some things you need to know. For starters, you can’t just treat your backyard like an all-you-can-eat buffet; the risk is too great that the insects outside are stuffed with pesticides, especially if you live in or near the city. Rather, buy them; since your grocery store is likely not an option, check out pet stores, anywhere that sells fishing bait, or even run a search on the Internet. Alternatively, if you’re really into the benefits of this food source, you might consider raising them yourself. Insects should also be prepared before consumption. Feed them fresh grains for a couple of days to purge anything from their bodies that humans shouldn’t ingest, then kill them by washing them with water before putting them in your freezer for approximately 15 minutes. I’d recommend cooking them for safety purposes before eating them—you can then add herbs, spices, or oils to make them taste delicious, too! Finally, if you’re not sure which insects to eat—or you’re in a situation where it’s bugs or nothing—do your research, whether online or through a list of edible flora and fauna kept in your emergency kit. However, a general rule of thumb is to not eat bugs with bright colors or a strong smell. Once you’re sure it can be safely eaten, enjoy; besides the amazing health benefits, you might just find you like the taste! “Insects as the food of the future: Locusts, grasshoppers, crickets, silk moth pupae, and beetle and moth larvae,” ScienceDaily.com, June 25, 2014; http://www.sciencedaily.com/releases/2014/06/140625101215.htm. Bryant, C.W., “How Entomophagy Works,” HowStuffWorks.com; http://people.howstuffworks.com/entomophagy.htm, last accessed June 26, 2014.